Do you love Dinos? You’ve come to the right place. Check the links below for Dino facts, fun puzzles, colouring sheets and more! Students examine specimens of modern and prehistoric insects by looking at fossils and replicas. Program Length: 1.5 HoursA dragonfly with a 1 meter wing span! A 7-foot millipede! Students examine specimens of modern and prehistoric insects by looking at fossils and replicas. Participating in hands-on centres, the students learn about Arthropods of the past and present. 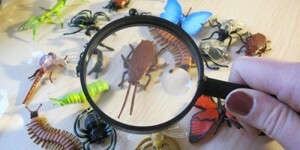 Science Topic E – Small Crawling and Flying Animals: Students examine live and fossilized small crawling and flying animals and come to understand their basic needs of air, food, water, shelter and any special characteristics that help the animal survive in its home. 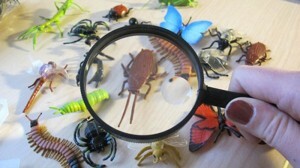 Students learn about the structure and life habits, where modern invertebrates (i.e. spiders, worms and other insects) and prehistoric insects and animals lived, what they ate, what they were eaten by and features of the animals that suit them to their particular environment.